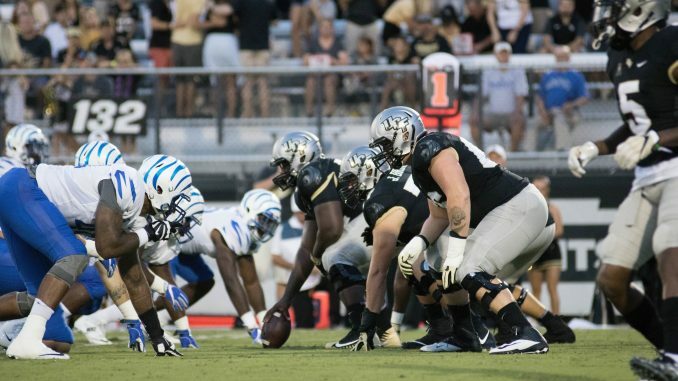 UCF and Memphis meet again on Saturday afternoon, just over two months since the Knights handed the Tigers their only loss of the season in 40-13 fashion. This time around, the conference championship is on the line. The Knights (11-0, 8-0 AAC) clinched their spot in Saturday’s title game with a heart-pounding 49-42 win over rival USF last Friday. The Tigers (10-1, 7-1 AAC) ran the table after losing in Orlando on Sept. 30, rolling through each opponent they faced. Offense will be the theme of Saturday’s matchup. UCF comes into Saturday’s game with the No. 1 scoring offense in the country, one that has scored fewer than 40 points just three times this season. “To watch [our offense] figure it out and develop confidence and cohesion and get to where they are, it’s been amazing,” UCF coach Scott Frost said. Sophomore quarterback McKenzie Milton (3,301 passing yards, 30 passing touchdowns) will continue to lead the way for the Knights, fresh off being named the AAC Offensive Player of the Year on Wednesday. He has no shortage of weapons either, as sophomore Adrian Killins (711 rushing yards, nine rushing touchdowns), redshirt junior Tre’Quan Smith (921 receiving yards, 11 touchdowns), sophomore Dredrick Snelson (511 receiving yards, five touchdowns) and others have come together this year to make up the nation’s top offense. Memphis’ offense is potent in its own right. The Tigers are second in the nation in scoring offense and fifth in total offense. The Tigers’ star quarterback, senior Riley Ferguson (3,500 passing yards, 32 passing touchdowns), has been strong all year. He has plenty of weapons at his disposal as well, with senior Anthony Miller (1,212 receiving yards, 14 touchdowns) and sophomore Darrell Henderson (1,045 rushing yards, eight rushing touchdowns) having huge seasons. Defense could be an issue for both sides on Saturday. The Tigers are allowing 30.2 points per game, while the Knights are giving up a better mark of 22.5. However, the UCF defense is coming off a rough performance on Black Friday, as USF put up 42 points and 653 total yards. With more at stake and weeks of success to build up confidence, Memphis will surely be hoping to redeem itself from its 13-point performance in Orlando earlier this season. Despite the fact that the Knights will have a bowl game to play after Saturday’s game, Frost could be coaching the team for the final time on Saturday. Rumors have picked up considerably this week about him taking the head coaching job at his alma mater of Nebraska. The team, according to the second-year head coach, remains dialed in on the task at hand. And after an emotional win over USF, the Knights came back strong in practice this week. No matter what lies ahead off the field, the Knights know their on-field goals are still in front of them. First, a victory would earn them a conference championship, which would be the program’s fifth (third since joining the AAC in 2013). A win would also get them to a New Year’s Six bowl game against a top-tier opponent. Kickoff for Saturday’s AAC Championship Game is set for 12:00 p.m.